I visited the memorial, it shows that yu really loved Buttons. If it's of any help, it's obvious that she loved you too and that you made her happy during this year with you, she certainly never wanted anything more than that. When you'll feel ready consider to save another cat and apply what Buttons has taught you. Recently a stray cat has been abandoned in my old grand-father's field and we took him in. I thought I wasn't ready but he needed us and we don't regret it. What's the Ledge Coming To? While my sister was running she met an old man that said he found a "kitten" amid the sunflowers that looked very hungry and said that he would bring him food. For a week she could only hear but not see the cat, until on Saturday my parents decide to go see him all together after dinner and we saw this beast running towards us. He's a male of circa 1 year old, castrated, very educated and playful but also big; I think they probably left him because he can't control his strenght. Thanks for sharing those stories guys.Once I get myself together here and clean up the house and flea bomb it.Then I will look for a cat like Buttons.Again it was hard to sleep last night since she always on the bed and window sill looking outside. I have or had a white/tan stray or some neighbors cat with no collar coming around here for the last 3 to 4 years and he/she disappeared when I got Buttons last August.The stray was living under the deck and he/she always run off if I walk towards her.Buttons more likely and told the stray to get out of my yard.Since earlier this year .Buttons stayed mostly inside and I let her out when I was outside in the yard.After Buttons stayed inside.They stray came back until few weeks ago .Just this pass Sunday the 21st of August as I was mowing the lawn .I almost mowed over a skeleton of a cat .The fur was orange color as it was in a separate pile about foot and a half from the skeleton. I have a bad feeling that is the stray cat which I hope its not the stray.So I have to clean up the bones and bury then in a Unknown cat tomb.Which is hard to do after what I'm going through with Buttons. I save these Buttons photos for the Ledge. Buttons with old Stevie photos.I'll look for more.I'm so happy that I took these.Sorry they are not the best but its better then nothing. Heres a tribute video that I just made today 48 hours at 2PM EST after loosing Buttons. I apologize on dwelling on this and taking it so hard and. move on and get another cat soon. To be honest .Also I have to say that Buttons brought me back to the Ledge as I was more likely to quit posting here as I went missing for awhile.Thanks to all of you for the support and love and kindness. Last edited by Macfanforever : 08-26-2016 at 03:41 PM. I guess everyone when their pet first leave them does things out of character, I remember years ago I wanted to make a slideshow for my other cat and the only thing that stopped me was that I didn't have enough photos. However welcome back, too bad that at the moment people aren't very stimulated to post because the political debate has gotten out of hands. On another note I noticed that you have a South-Italian surname Skip, am I wrong? Thank you SisterNightroad.I'm so happy that I took about 500 plus photos of her including videos in the short time that she was here.I will do the same with the next cat when I get it.Later I will put together a slideshow video and other videos of her and post it.I'm still feel so awful and crying over this. Yes .Raccio .My dad was full blooded Italian and his father was from Italy .I have to ask my sister or my Uncle John which part since her and my dad went to Italy I think back in 2010 and visit the town that my grandfather came from. My mom was part French and German. The surname Raccio is from Campania. Skipping over the political and social problems, I visited it a bit and it's a place of immeasurable historical and artistic beauty, as well as delicious cooking tradition. Thanks .I'll run that town name by my sister and uncle. Time to introduce this new punk. We found him two weeks ago in the middle of a sunflower field at night; we thought he was a "kitten" but it turned out he's a lynx. We named him Tobia and he's a rollicking overgrown baby of almost 6kg with a tabby ochre coat. Wow.He 's beautiful and going to get big.He's going to be a great watchcat. 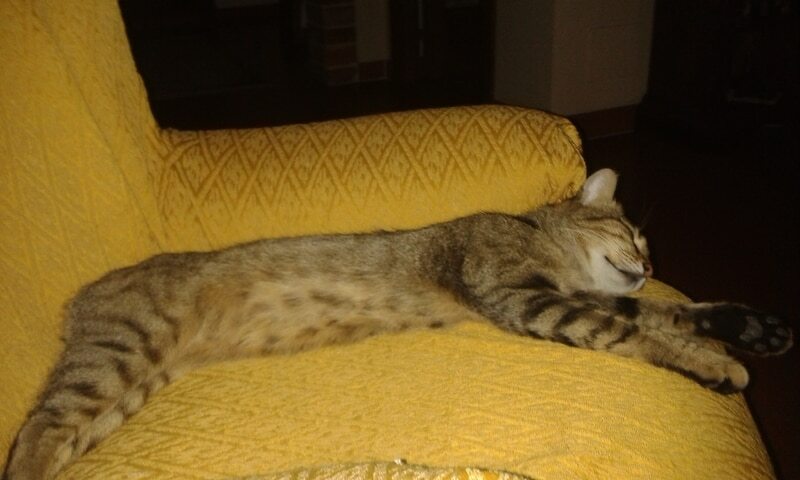 In truth I hope he doesn't grow anymore, he's already big even if he doesn't look like it, you have to think the armchair is very big and if he stretch from the ground without jumping he can easily reach over the table; that's how he stole a slice of ham. Hahahahaha.He's stole the ham.LOL.He'll be OK .Buttons was a good fighter.